The wealthiest members of Congress grew richer in 2009 even as the economy struggled to recover from a deep recession. The 50 wealthiest lawmakers were worth almost $1.4 billion in 2009, about $85.1 million more than 12 months earlier, according to The Hill’s annual review of lawmakers’ financial disclosure forms. 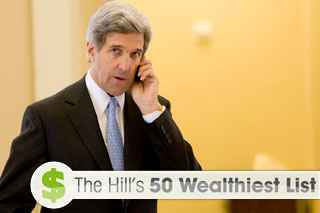 Sen. John Kerry (D-Mass.) tops the list for the second year in a row. His minimum net worth was $188.6 million at the end of 2009, up by more than $20 million from 2008, according to his financial disclosure form. While the economy struggled through a recession during much of 2009 and the nation’s unemployment rate soared to 10 percent, the stock market rebounded, helping lawmakers with large investments. The S&P 500 rose by about 28 percent in 2009.